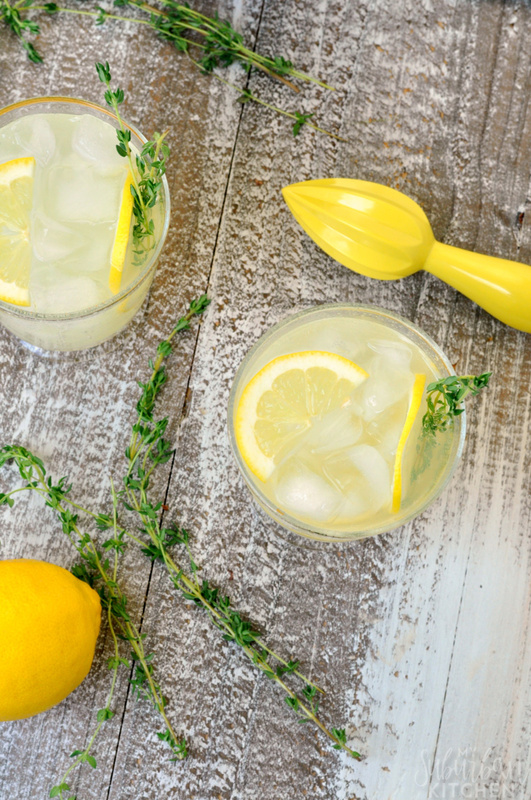 Spice up everything from cocktails to salad dressings with the delicious thyme simple syrup. With just three ingredients, you have a versatile syrup that can be used in tons of different recipes to add a subtle flavor of thyme. Simple syrup is used in so many recipes: from cocktails to salad dressings to even popsicles. 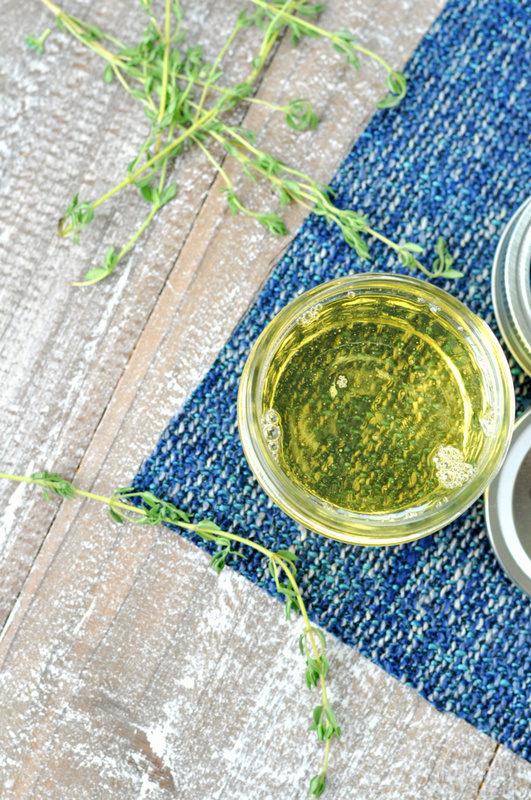 This version teaches you how to add the fresh flavor of thyme (or any herb really) to create a delicious thyme simple syrup. 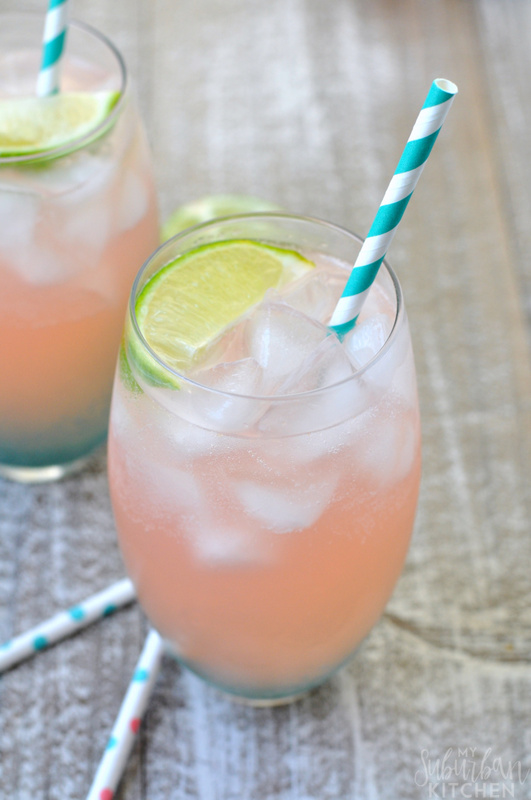 It is perfect for cocktails or even a delicious glass of lemonade! I will admit to actually buying simple syrup from the store in the past. That was, of course, before I realized how absolutely simple it was to make simple syrup (also called sugar syrup by some). Simple syrup is made by combining equal parts sugar and water and then heating it until the sugar dissolves. Once cooled, it turns into a delicious syrup that is perfect for sweetening all kinds of things but, especially, cold, summer drinks! 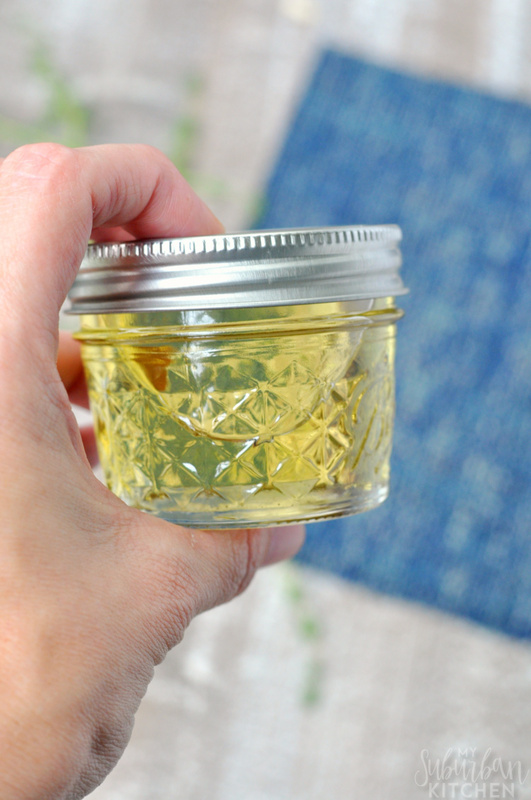 The awesome thing about making your own simple syrup is that you can add flavors to it to create things like thyme simple syrup, rosemary or basil simple syrup and even a lime flavored version. Using these simple syrups in place of sugar for cold drinks is perfect because the sugar is already dissolved! I always make a few different simple syrup versions and keep them in the fridge to use throughout the summer. A basic version, with no additions, lasts for 3-4 weeks. If you add any flavoring, the syrup should last for approximately 1-2 weeks in the refrigerator. Once you make simple syrup the first time, you will find it is so simple and never consider buying it again. 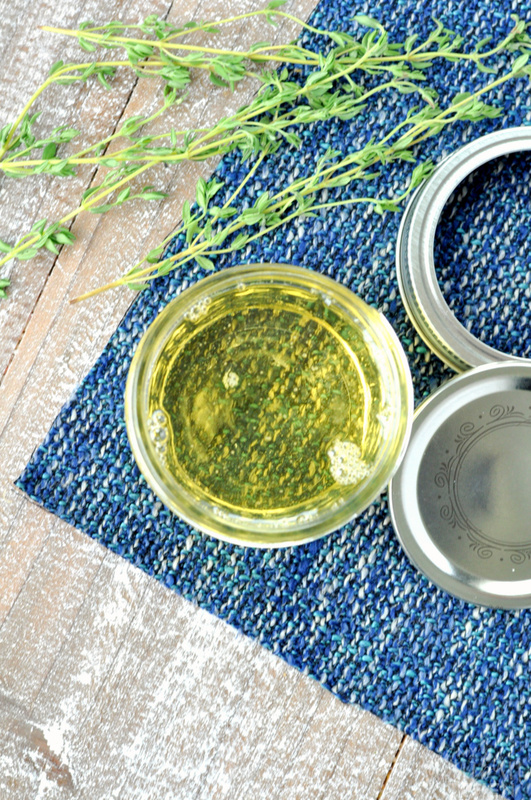 Of course, you’ll also want to start getting creative and making different versions using everything from citrus rinds to vanilla beans to fresh herbs, like in this thyme simple syrup. 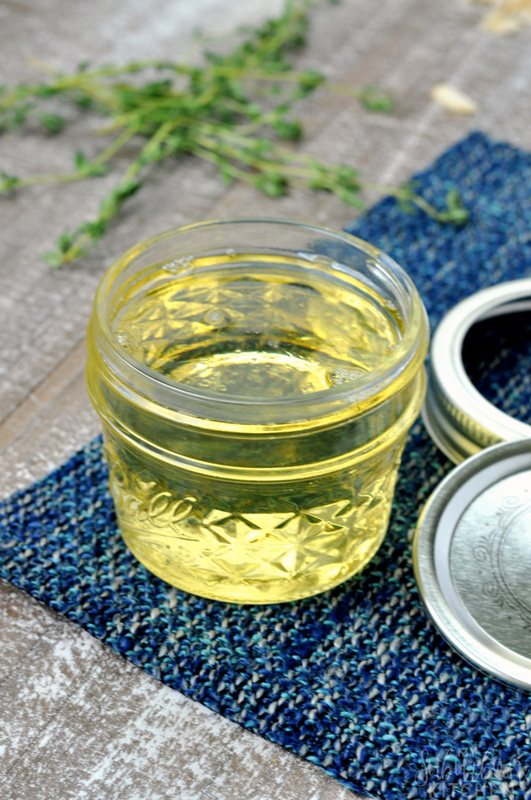 If you make this thyme simple syrup or any other recipe from the blog, I’d love to hear about your experience. Let me know if the comments or snap a photo and tag it #MySuburbanKitchen on Instagram or Twitter. 1. In a small saucepan, combine sugar and water. Bring to boil and stir until the sugar is completely dissolved. 2. Once sugar is dissolved, remove from heat and add thyme. Let cool completely. Remove thyme and transfer to airtight container. Store in refrigerator up to 2 weeks. 1. You can replace the thyme with any other fresh herb (basil, rosemary, etc), vanilla beans, citrus rind or even whole spices. 2. If you want unflavored simple syrup, follow the above recipe but leave out the thyme. Unflavored simple syrup will keep for 3-4 weeks in the refrigerator.